On the heels of yet another group of Nigerian girls abducted by Islamist militants on Tuesday, First Lady Michelle Obama joined the social media campaign to rescue the missing. 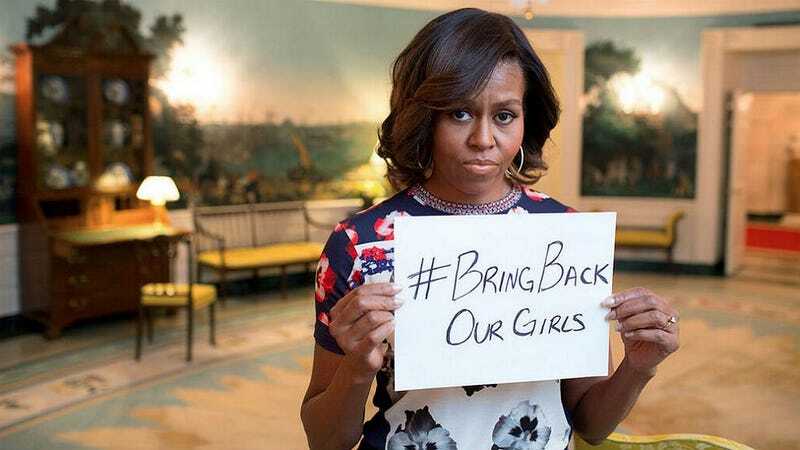 In a twitpic on Wednesday, the FLOTUS held a sign reading #bringbackourgirls, adding to the international digital pressure upon the Nigerian government and President Goodluck Jonathan to actively rescue the abducted girls. Her words dovetail with President Obama and Secretary of State John Kerry offering American support to the Nigerian government for the search-and-rescue efforts of the girls. Elsewhere, new reports of another Nigerian town under attack have surfaced detailing a 12-hour fire fight between local police and suspected members of Boko Haram on Monday, according to CNN. Wearing military uniforms, the militants arrived with three armored personnel carriers, they said. They shouted "Allahu Akbar" — "God is great" — and opened up on the market, firing rocket-propelled grenades and tossing improvised explosive devices, witnesses said. Some marketgoers tried to take shelter in shops only to be burned alive when the gunmen set fire to a number of the businesses, the witnesses said. A few Nigerian soldiers who had been left behind at the village could not hold off the assault and were forced to flee, they said. Many sought safe haven in nearby Cameroon, they said. The death toll is reportedly almost 300.